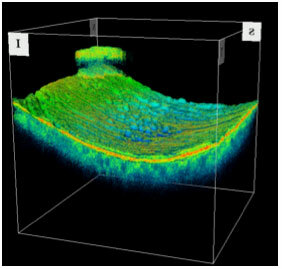 Optical coherence tomography (OCT) has emerged as an important diagnostic tool for retinal diseases in the last decade. Time domain OCT (TDOCT) technology was the first introduced and most widely employed OCT technology. Recently, newer machines employing spectral domain OCT (SDOCT) have become commercially available. This technology features greater scan acquisition speed, potentially higher resolution images and more reproducible measurements. In addition, the enormous amount of data produced can be reconstructed to produce three dimensional images, movie files, and alternative reports. OCT interpretation can be categorized broadly as quantitative and qualitative. The macular thickness map report of TDOCT provides average retinal thickness measurements in each of the nine subfields within the ETDRS grid. The convention of using this report has carried over to the SDOCT. Quantitative OCT analysis involves determining the accuracy of the machine-generated thickness data before using these data. A variety of artifacts, both operator dependent and independent, affect the quality of the images and reports in both TDOCT and SDOCT. Clinical and research related use of OCT scans in AMD has focused largely on neovascular AMD. Change in retinal thickness has served as an important secondary endpoint for clinical trials in neovascular AMD.1,2,3 Presence of neovascular AMD has been shown to increase the frequency of artifacts, especially boundary line (BL) errors.4,5,6 Internal data at a reading center showed BL errors occurring >50% of the time in patients with neovascular AMD. The centerpoint thickness is inaccurate in the presence of artifacts, and caliper measurement of foveal thickness is required in such scans (Figure 1). Figure 1: Time domain OCT scan of a macula with neovascular AMD. Both inner and outer boundary lines have errors. OCT measured retinal thickness of centerpoint (344 microns) is inaccurate and needs to be replaced by caliper measurement of the centerpoint (414 microns) or have boundary line correction. The more recent software version of Stratus and some SDOCTs includes the ability to correct BL errors manually, with subsequent recalculation of the volume measurements automatically (Figure 2). This manual process is more resource intensive than a caliper measurement at this time. While artifacts such as BL errors and decentration can be overcome using the SDOCT software, artifacts such as scan registration error still demand operator skill to identify them and retake the scans (Figures 3 and 4). Figure 3: Decentration artifact: The central subfield is not centered on the macula ( blue area). The grid has been repositioned to obtain the correct thickness values. Note that the outer temporal and inferior subfields fall off the scanned area and may not represent accurate thickness values. Figure 4: Scan registration error (Z-offset error) showing up as a ripped edge in the pseudocolor map. Quantitative OCT assessment of dry AMD has been reported only rarely. The resolution of TDOCT scan has not been sufficient for assessing the outer retinal layers in detail. Few studies with ultrahigh resolution OCT and SDOCT show evidence of better visualization of the outer retinal layers compared to TDOCTs9,10 (Figure 5). 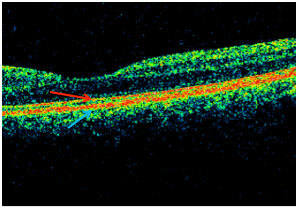 Figure 5: Outer retinal layers in Spectral Domain OCT (512 A scans per B scan); 2 layers of hyperreflectivity are discernible over the entire scan length. The first layer corresponds to the inner segment - outer segment (IS-OS junction)(red arrow) and the second layer corresponds to the RPE Bruch's membrane complex (blue arrow). This has led to the idea of using SDOCT to automatically segment the drusen to provide area and/or volumetric variables which may be tracked over time10 (Figure 6). Figure 6: Drusen volume map in SDOCT 3D analysis software; though unvalidated, this analysis holds promise for AMD clinical research. The reproducibility of such methods has not been established to date. Given the relatively recent development of effective treatment of neovascular AMD, the development of new treatments for early stages of AMD will assume increasing importance in clinical trials. This will provide new opportunities to develop OCT variables to quantify and monitor dry AMD. Reference(s): 1. Emerson MV, Lauer AK, Flaxel CJ, et al. Intravitreal bevacizumab (Avastin) treatment of neovascular age-related macular degeneration. Retina 2007;27:439-44. 2. Fung AE, Lalwani GA, Rosenfeld PJ, et al. An optical coherence tomography-guided, variable dosing regimen with intravitreal ranibizumab (Lucentis) for neovascular age-related macular degeneration. Am J Ophthalmol 2007;143:566-83. 3. Moshfeghi AA, Rosenfeld PJ, Puliafito CA, et al. Systemic bevacizumab (Avastin) therapy for neovascular age-related macular degeneration: twenty-four-week results of an uncontrolled open-label clinical study. Ophthalmology 2006;113:2002 e1-12. 4. Ray R, Stinnett SS, Jaffe GJ. Evaluation of image artifact produced by optical coherence tomography of retinal pathology. Am J Ophthalmol 2005;139:18-29. 5. Sadda SR, Wu Z, Walsh AC, et al. Errors in retinal thickness measurements obtained by optical coherence tomography. Ophthalmology 2006;113:285-93. 6. Krebs I, Haas P, Zeiler F, Binder S. Optical coherence tomography: limits of the retinal-mapping program in age-related macular degeneration. Br J Ophthalmol 2008;92:933-5. 7. Patel PJ, Chen FK, Ikeji F, et al. Repeatability of stratus optical coherence tomography measures in neovascular age-related macular degeneration. Invest Ophthalmol Vis Sci 2008;49:1084-8. 8. Van de Moere A, Sandhu SS, Talks SJ. Correlation of optical coherence tomography and fundus fluorescein angiography following photodynamic therapy for choroidal neovascular membranes. Br J Ophthalmol 2006;90:304-6. 9. Srinivasan VJ, Monson BK, Wojtkowski M, et al. Characterization of outer retinal morphology with high-speed, ultrahigh-resolution optical coherence tomography. Invest Ophthalmol Vis Sci 2008;49:1571-9. 10. Yi K, Mujat M, Park BH, et al. 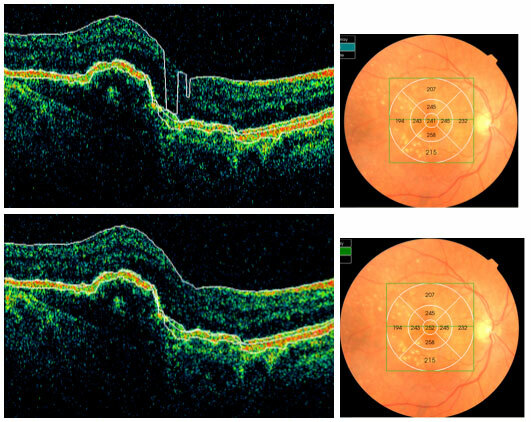 Spectral Domain Optical Coherence Tomography for Quantitative Evaluation of Drusen and Associated Structural Changes in Non-Neovascular Age Related Macular Degeneration. Br J Ophthalmol 2008;12:12.